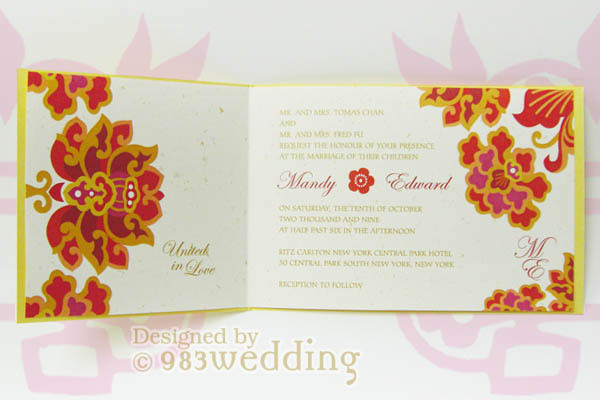 This is a Chinese wedding invitation with red and gold color scheme. 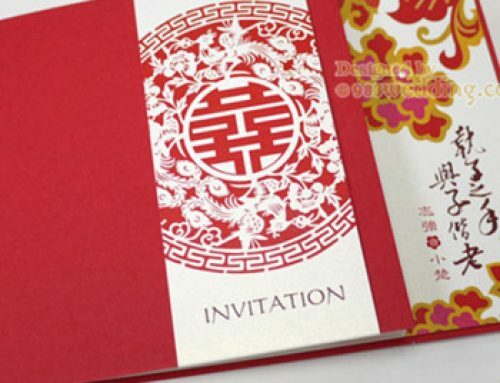 The double happiness paper cutting pattern makes the invitation look more unique. 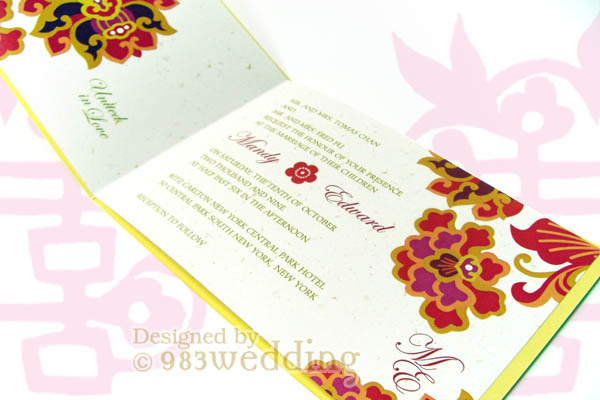 This is another Chinese wedding invitation design with double happiness and butterflies. In order to create a traditional Chinese look, the cover is gold in color. We have chosen a paper stock which is in yellowish gold. Prints on the cover are in red or pink color tones. In this design, we have used butterflies and cherry blossom, as well as double happiness symbol as the main design elements for the cover. The butterflies and cherry blossom are printed on the cover in a pink color. 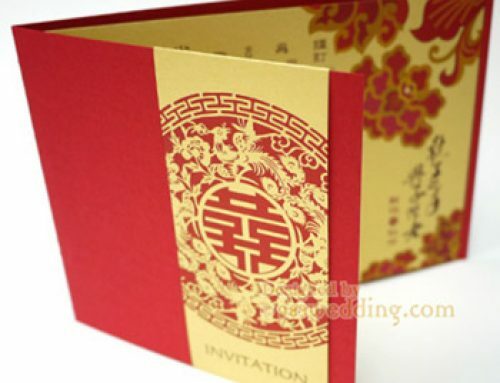 On the other hand, the double happiness paper cutting pattern is printed in red color. We do not make them all in the same colors as we do not want to make the design look too busy. 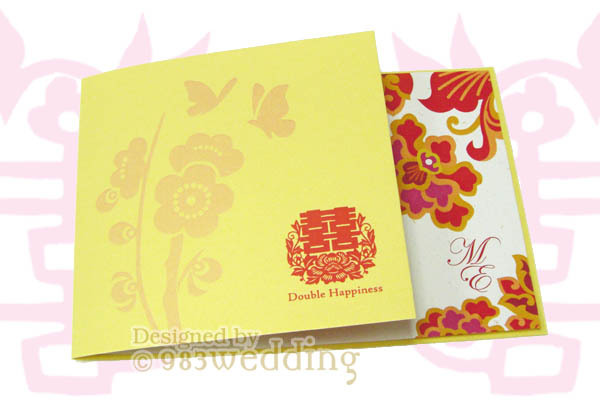 We would like to make the butterflies and cherry blossom more subtle, when compared with the double happiness symbol. All these design details will make the card to look traditional. The patterns printed on the insert is mainly red in color. 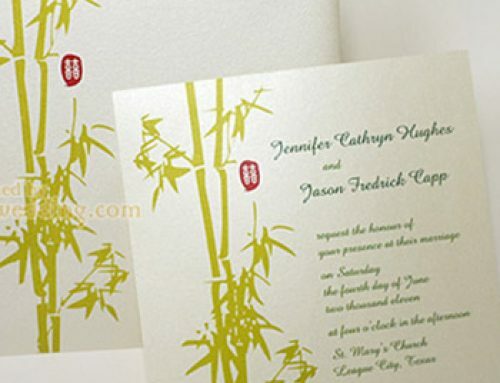 A traditional Chinese pattern is printed on a piece of white color paper. It is a colorful abstract floral pattern in Chinese style. Besides different shades of red, you can also find a bit of yellowish gold color in this pattern. If only one language is needed to print on the insert, the wording will be printed on the right-hand side of the insert. The left-hand side will be printed with the couple’s names and a big abstract floral pattern which echoes the one on the right. Since the wording will be printed on the right-hand side, the patterns on this side will not occupy the whole page. 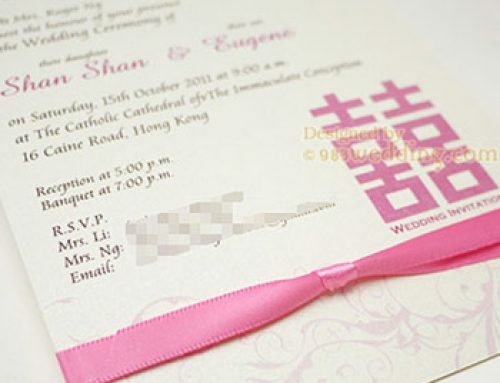 The initials of the couple are also printed on the right-hand side of the insert. This part is in fact visible even without opening the card. 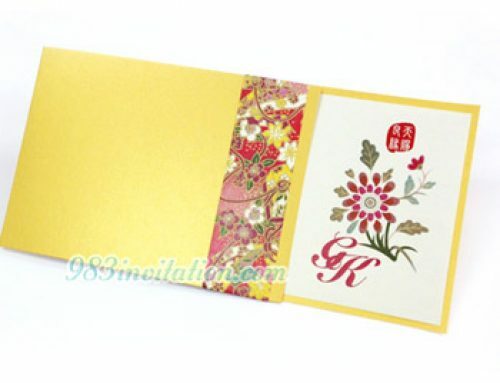 So, your guests will see part of the patterns and also your initial once they open the envelope. The initials are designed as a simple monogram of the bride and the groom. Insert: 100gsm Sunshine paper. Full-color printing on one side. Insert glued on the card inside.